Number One for Scam Prevention in Blackburn, you can always rely on Countywide Computer Services for a quick and efficient service. Online scams cost UK citizens around £10bn a year and only about 5% of these are ever reported. 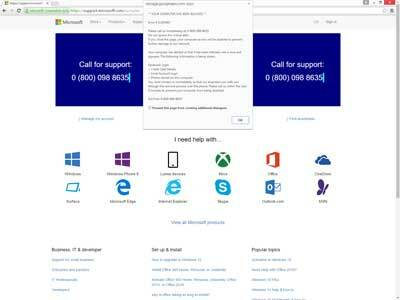 This page will be covering the 2 most common types of scams, The Microsoft Technical Support Scam & Email Scams. I will show you how to recognise a scam and what to do if you fall victim to these rogues. The most common and well known scam is the Microsoft Technical Support Scam. This works by convincing an unsuspecting and usually computer illiterate person that their computer has a problem or is sending error messages to Microsoft. There are usually 2 ways that the scammers will make contact with their victim. The 1st way is by telephone call. They will usually have your name and will usually claim to be from Microsoft. Most of the time they will have a thick foreign accent. The 2nd way is by using a fake website similar to the one shown above. This will usually not let you close the page by normal methods and will use scare tactics to make you call the included number. Please take note that because the telephone number appears to be a UK number, such as 0800, the person on the other end will probably be in Africa or Asia but mostly based in an Indian call centre. The job of the so called "Technician" is to convince you that your computer has viruses or that hackers are attacking it. They are just following a script and tell everybody the same thing and I suspect they know nothing about computers. The 1st thing they will do is connect to your computer so that they can show you the problem. NEVER let anybody you don't know or trust connect to your computer. Their next task will be to open up a program called Event Viewer and show you a series of errors, telling you that all these are viruses. They are nothing of the sort and most of these errors are quite normal even on a brand new machine. Next they will run a command called tree in a command prompt window and tell you that this is doing a scan. All this command does is display a list of the folders and files on the computer and takes a few minutes. While this is completing, they will write an innocuous message stating that your computer is infected that will appear after the command is finished and they will point this out to you. The next command they will run is the netstat command. This command shows all incoming and outgoing connections to your computer. Most of these will be Microsoft for things such as Windows Update etc. and are normal. They will tell you that all of these are hackers. The next job is to show you that a virus has stopped all the services on your computer. Another lie as services only run when they need to do so. So far, all they have done is try to convince you of problems that don't really exist. Next comes the phase where they either steal or erase your files or make your computer unusable. They will use the dreaded Syskey tool. This will ask you for a password every time you turn your computer on. The only way to circumvent this is to call someone like myself to remove it. In severe cases this may require reinstalling Windows. Please note that Windows 10 does not have the Syskey tool. So how do you not fall victim to this scam. Firstly, hang up if anybody calls you saying there is a problem with your PC. Microsoft will NEVER call you unless you ask them to. If you come across the fake website that can't be closed down, the best way is to open Task Manager using Ctrl, Alt, Delete and closing all processes to do with your browser. Or you can reboot. NEVER phone them or let them connect to your computer. There are various types of Email scams from the very convincing to the totally stupid. Unfortunately, even the stupid ones are fallen for. How many times have you received an email from someone in Africa saying they have $500,000 to give you. So why do people fall for this type of scam? Hope possibly, that it may be real. Same as people do the lottery every week in the hope that they will win when in reality, that is not very likely. These types of scams usually require that you send a fee to unlock the money, usually a few hundred dollars. 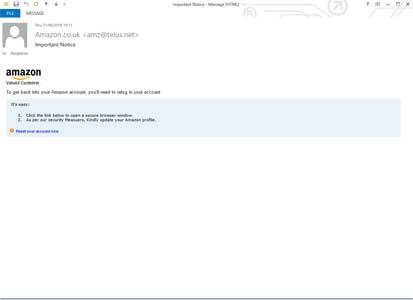 The second type of Email scam is where it says your account will be locked or frozen unless you perform an action such as clicking a link or opening an attachment. These are usually from banks or other financial institutions such as Paypal. These can look very convincing and can even take you to a copy of the bank's website where you enter your username and password, which goes straight to the scammers. There are a few ways to tell if it is a scam. Does it have your name on it? Hover but DO NOT CLICK the link, look at the status bar and you should see the address that the link goes to. Does it look legit or dodgy? NEVER open an attachment on an unsolicited Email and ALWAYS treat every Email as suspicious. Another type of scam that I see in my inbox on a regular basis is claiming to be from Amazon. Usually states that the sender bought something from me, again with a dodgy link to click. I don't sell on Amazon so I know it is fake. Email scams are usually designed to extract information from you by a process called Phishing. It is usually usernames and passwords that they are after. There are far too many scams to mention in this article. Just be very careful what you click and have your wits about you! Just thought that I would include the deplorable type of scam that this is. This type of scam targets the possibly vulnerable and lonely people looking for love or companionship. This usually starts at a legitimate dating site but the profile of a user is fake. Most of these are based in Africa and after the victim starts an online relationship, the scam begins. Usually asking for money for hospital fees or other things that are made up. Anybody that asks for money from these sites are fraudsters and should be avoided. If you have ever been scammed online, I would love to hear from you. Please send me a message on the Contacts Page. 01254 447107 for Online Scam Prevention in Blackburn.